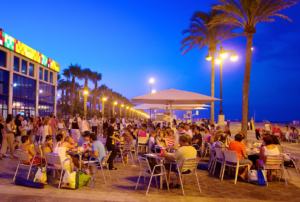 The Malvarrosa Beach is a fine golden sand beach, lined by a promenade, restaurants and cafés. 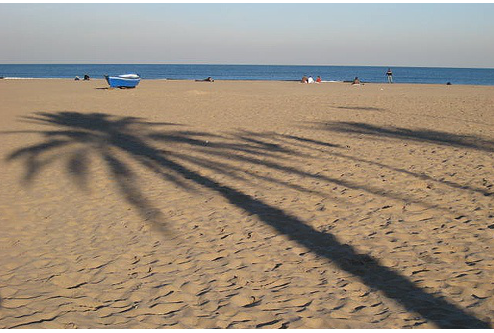 It is the most famous beach in Valencia. Its name, along with then name of the neighborhood, dates from 1848 when the French botanist Felix Robillard, head gardener of the Champs Elysees, bought a large piece of land and planted several species including geranium odoratissimun, the popular Malva-Rosa, which he cultivated on an industrial scale for his plant essences factory. 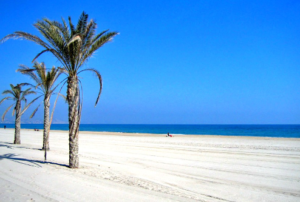 The beach, which at that time was used to unload fishing and for the trade between the different villages near the capital, the beach became a resting place of the Valencian bourgeoisie. Among the illustrious of the era that used to visit the Malvarrosa Beach, the history are Joaquin Sorolla and Blasco Ibáñez. Today, this large, open beach has a lively appearance, offering a wide variety of services and activities throughout the entire year.